"Deep garnet in color with a hint of purple, the 2015 Cabernet Sauvignon I de V is a little closed to begin, soon unfurling to reveal notes of baked plums, crème de cassis and cedar chest plus touches of garrigue, dried Mediterranean herbs, underbrush and fungi with a faint waft of tapenade. Full-bodied, concentrated and hedonic in the mouth, it gives up bold black fruit preserves flavors with loads of earthy sparks, framed by taut, grainy tannins and bold freshness, finishing long." "Medium to deep garnet colored, 2015 Cabernet Sauvignon Leonardini Vineyard begins a little shy, with coaxing revealing fragrant notes of fallen leaves, dried lavender, underbrush and wild sage over a core of red currant jelly, black cherry compote and warm cassis plus a touch of bay leaves. Medium to full-bodied, the palate is packed with vibrant red and black fruit, sporting a firm, grainy texture and bold freshness, finishing long and herbal laced." "Medium to deep garnet in color with a hint of purple, the 2015 Millennium MM Vineyard delivers intense scents of baked black cherries, mulberries, red currant jelly and black currants with wafts of fried herbs, wood smoke, tar, tilled earth and lavendar. The full-bodied palate fills the mouth with herb-laced fruits, framed by firm, grainy tannins and oodles of freshness, finishing long and mineral laced." "Deep garnet-purple colored, the 2015 Cabernet Sauvignon Mancino Lanciatore comes bounding out of the glass with open-knit notes of Christmas cake, plum preserves, warm cassis and Black Forest cake with touches of star anise, cigar box and pencil lead plus a waft of bouquet garni. Big, concentrated and decadently fruited in the mouth, the palate gives up loads of black fruit preserves and a velvety frame, finishing very long and very spicy." "Medium to deep garnet-purple colored, the 2015 Cabernet Sauvignon Leonardini Estate is a little soft spoken and reticent to begin, giving up subtle notes of crushed red and black currants, kirsch and wild blueberries with wafts of cedar chest, wild thyme, tilled soil and iron ore. Medium to full-bodied, the palate has a compelling quiet intensity, with firm, ripe, grainy tannins and lovely freshness supporting the crushed red and black berry layers, finishing on a persistent mineral note." Dark cranberries and dried cherries burst out of this wine aromatically, coupled with cocoa dust, fresh strawberry jam, cherry cola, pomegranate, and toasted vanilla. On the palate, this Merlot has fine, firm tannins alongside black cherries, red currants, goji berries, and toasted walnuts. It is supple in texture and shows attractive depth on the finish. Three generations of the Leonardini Family (Tre Leoni) are responsible for this expertly made proprietary blend of Cabernet Sauvignon, Merlot, Syrah and Zinfandel. 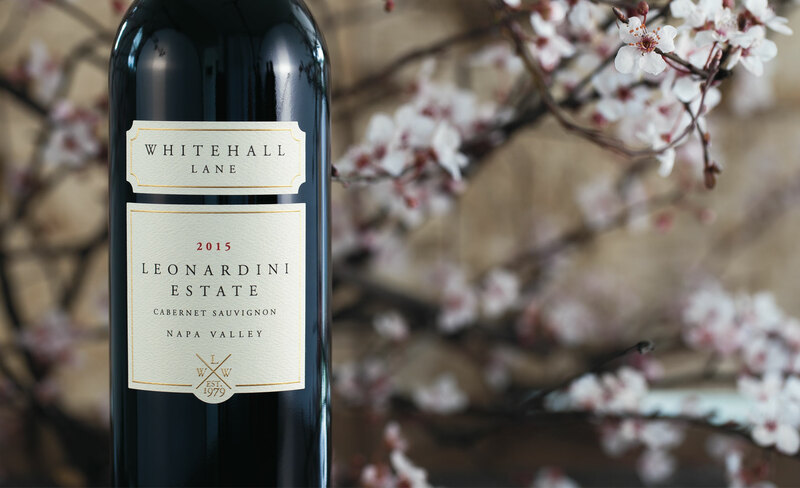 Whitehall Lane and the Leonardini’s are known for making elegant, sophisticated Cabernets. Tre Leoni, while a serious blend, is a little fun and distinctly delicious. The 2016 Luchtel Vineyard Syrah offers fragrant notes of mixed berry compote, violets, blueberry fritter, white pepper, and baking spices. On the palate, the tannins are soft and supple, while the flavors are showing sweet red currants, stewed black plums, beetroot, rhubarb, and a touch of cinnamon. This 2016 Malbec is deep in color, aromas and flavors. With an almost magenta color, it is loaded with rich and fragrant characters of blueberry pie, licorice, grape jolly rancher, sweet Agen prunes, vanilla, and pencil shavings. This is a full-bodied, balanced wine, with flavors jumping out of the glass. It provides generous amounts of juicy blackberries, subtle toastiness, integrated tannins, and stewed black plums. This Zin has appealing aromas of fresh strawberries, dried cranberries, spice box, and a hint of white pepper and cinnamon. On the palate, it bursts with raspberry tart, goji berries, red currants, sweet cranberries, and toasted hazelnuts.